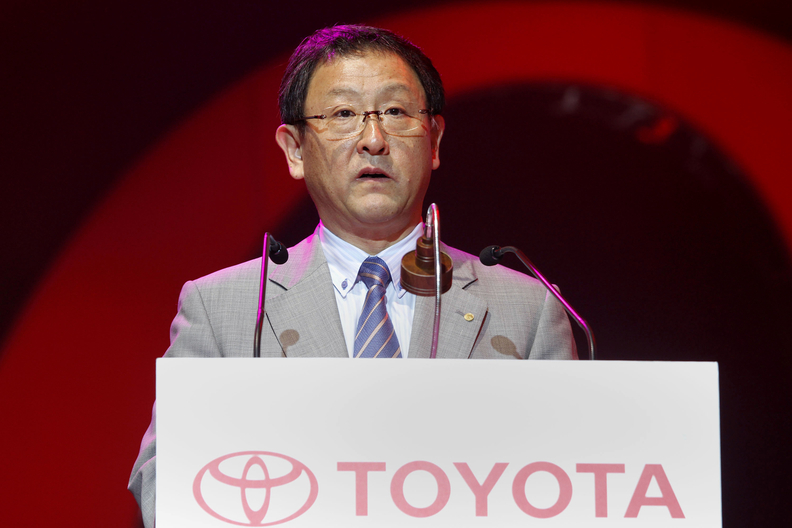 Toyoda: "When we think about what customers value in our cars, it's reliability." TOKYO -- Toyota has no intention of offering ultra-cheap cars to boost sales in emerging markets and will keep its focus on customers who expect a certain level of reliability, the company's president, Akio Toyoda, said on Thursday. Toyoda's comments come days after rival Nissan announced the revival of the Datsun brand to target buyers in the lowest and sizeable end of developing markets, while a German magazine reported Volkswagen was also planning a similar move. "We are a full-line carmaker," Toyoda told a small group of reporters in Tokyo. "But to grow sustainably, we need to make a certain level of profit on cars, no matter how big or small they are. Does Toyota have the ability to make cars for 500,000 yen ($6,000) like Tata Motors? I don't think so," he said, referring to the Indian automaker famed for developing the world's cheapest car, the Nano, whose sales have fallen short of targets. "When we think about what customers value in our cars, it's reliability," Toyoda said, adding that was evident in the popularity of used Toyota cars in many Asian countries. "We won't risk sacrificing quality simply to meet a certain price range," he said. As demand becomes saturated in the developed world, global automakers are eyeing low-cost cars to drive sales growth, especially among first-time buyers moving up from motorcycles and used cars in emerging markets such as Brazil, Russia, India and China. Toyota has taken small steps to target that base, starting with the made-for-India Etios model. But analysts have said the starting price, of just under 400,000 rupees ($7,800) for the lowest-grade hatchback version, was still too high to challenge cut-price stalwarts such as Maruti Suzuki. Nissan, meanwhile, is counting on Datsun to tap a price range uncharted by global automakers as it aims to join Toyota, General Motors and Volkswagen at the top of the sales charts with French partner Renault. In contrast, Toyoda said he wanted Toyota to put its energy into developing products for the middle- to upper-class where its strengths lie, even if that meant playing in only a fraction of big, emerging markets. "China has 1.4 billion people, but we don't have to target all 1.4 billion," he said. "We'll target perhaps 200 or 300 million of that - but that's about the size of the whole U.S. market. It's huge." While GM and Volkswagen fight it out for sales dominance in China and the rest of the world, Toyoda said he wanted Toyota to strive for industry leadership in other ways, much like GM did by developing the industry as the biggest carmaker over more than 70 years. "Until we overtook them (in 2008), GM was number one, uninterrupted since the 1930s. During that time, it helped the industry develop and created a culture of cars. That's the kind of company that deserves to be the industry leader," he said. "Going forward, I think there will be a lot of shuffling around among the top five or seven. But for the crown to really mean anything, I don't want to use it as a motivational tool," he said, repeating his warning that unchecked sales growth had played a role in Toyota's quality crisis a few years ago. Toyota fell to third place in global vehicles sales behind GM and Volkswagen last year, hit by the disruption that followed the earthquake and tsunami disaster. Toyoda said he's looking forward to a disaster-free year after calamities in Japan and Thailand hobbled production. "What we want more than anything is for nothing to go wrong this year," Toyoda said. "I feel that we have hit rock bottom and that we are turning the corner." The automaker is forecasting group sales to climb 21 percent to a record 9.58 million vehicles this year after natural disasters in Japan and Thailand hobbled production in 2011. Prior to that, Toyota recalled more than 10 million Toyota and Lexus vehicles worldwide in 2009 and 2010 for defects associated with unintended acceleration. In China, the maker of the Prius, the world's best selling gas-electric car, is planning to focus on expanding sales of hybrid vehicles, Toyoda said. He also reiterated company plans to maintain Japanese production of 3 million vehicles annually. On the yen, Toyoda said he hopes the Japanese currency continues to weaken to help improve profitability. The yen, which appreciated more than any major currency for two straight years, is the worst performer this quarter after its value depreciated more than 7 percent against the dollar, according to data compiled by Bloomberg.